It has been explained why Alastair is wrong many, many times, but Alastair refuses to listen. Alastair, do you really think that our understanding of absorption has not improved since 1901? Really? Please actually read it this time. “The odds that temperatures will increase more than 4 degrees by 2100 in this so-called “business as usual” scenario increased from 62 percent to 93 percent, according to the new analysis. temperature drives amplifying feedbacks. Global ocean temperature is a major factor affecting ice sheet size, as indicated by both model studies (Pollard et al., 2015) and paleoclimate analyses (Overpeck et al., 2006; Hansen et al., 2016). Eemian ocean warmth, probably not more than about +0.7◦C warmer than preindustrial conditions […], corresponding to global warmth about +1◦C relative to preindustrial, led to sea level 6–9 m higher than today. of +1.3◦C relative to pre-industrial temperature, and even the (+1.05◦C) underlying trend to date without the El Niño boost, is probably too high for maintaining our present coastlines. (3) actions that, at minimum, eliminate net growth of non-CO2 climate forcings. 2.2 ppm in yoy comparison. The actual increase rate is higher, this number is damped a bit by the transition from EN-like conditions to LN-like conditions. I think the background rate is closer to 3.0 ppm and it has been an upward-sticky number since our ancestors figured out how to start using fire. I know it seemed like a good idea, we just overdid it. In less you believe CO2 does not cause global warming, if that is the case, please send me your investment funds so I can help you help me achieve true financial and climate security. Chris, @39, I’ll take a shot at it. Less sea ice does mean a lower pole to equator temp gradient, which does weaken the high altitude winds (often called jetstream). Somehow that leads to flow dynamics with a greater propensity for loopiness. Of course greater loopiness leads to (on average) allow more heat exchange between the arctic and lower latitudes, which leads to yet further weakening of the gradient. But the key mystery is in the fluid dynamics, which I have the impression isn’t well understood. I think that missing link in the science, is why you don’t get too many climate scientists jumping onto the warmer arctic leads to bigger arctic outbreaks bandwagon. It seems to be happening, but I don’t think the confidence that it will intensify in a warming world is there. It also matters how that heat exchange occurs. Is it more democratic, i.e. do the north south flows occur at different longitudes, or do they tend to come down in one region (like the US east). Also do those locations move around, or do the warm/cold outbreaks stay in the same place longer. I’ve been arguing that on Realclimate for some time. Glad to hear it said so well. Why have climate scientists been misleading us? Andersons suggests that they want to continue to be invited to the conferences on climate change. That is, they are afraid of being outcast because they are too extreme. Anderson says that climate scientists, off the record, will acknowledge that they are underestimating the extent of the danger. That is my experience also. Can any “insider” provide any further information on the climate scientists’ motives for downplaying the dangers? I suspect that a major reason is that the climate models are very uncertain when forecasting other than short-term impacts. Any faulty judgements concerning the parameters leads to more inaccuracies the more years have passed. In that environment, climate scientists perhaps think they will look better if it turns out that they have underestimated the impact, than if they have overstated it. They fear being shown to be wrong in the extreme direction – to have overly cried wolf. It’s a magical “greenhouse effect” of the atmosphere, Matthew. The sun doesn’t melt ice, it’s the atmosphere which raises the temp of this planet from minus 18deg C to plus 15deg C .
Mind you, there are people like myself who have a different wiew…. Yeah, so, we have time only for…. you guessed it…. simplification. How to find the words that will lead the horses to water *and* make them drink…? J.Koch was not a lab assistant. He was Prof. Angstrom’s PhD student, and he conducted a series of experiments on his own which he published [McDonald, A. B. (2016) Translation of Koch, J., 1901. [Online]. Available at https://www.researchgate.net/publication/310460429_Translation_of_Koch_J_1901 (Accessed 15 March 2017)], and was awarded his doctorate. That paper makes no reference to the overlapping of CO2 lines, which causes saturation. There are several other errors in your essay both factual and your references, but you made it clear that you did not want my help with your investigations. However, I cannot resist the temptation to point out that it is no wonder that your model of the Venus atmosphere does not work when you think that “saturation doesn’t f****g matter”. Being in the mood for a laugh, I checked it out. Unfortunately, it wasn’t nearly as amusing as I hoped–though it was just as wrong as I expected. Top marks for arrogance, though. Complete and utter nonsense. Learn some science. No energy left to re-radiate is a nonsensical statement. All matter with temperature above absolute zero radiates heat. Some energy may be convected or conducted away, but some energy is ALWAYS radiated. If there is energy there is ALWAYS energy left to re-radiate. ALWAYS. I did post what I thought was evidence but the link was incorrect. The correct link is here. It shows the transmittance in an atmosphere with CO2 AT 280 ppm. 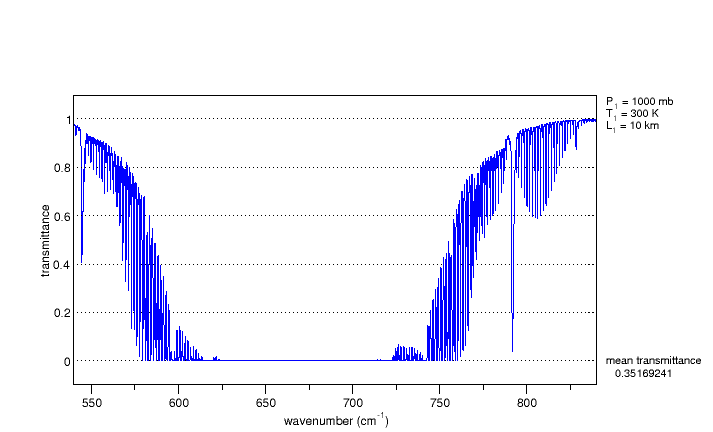 It is quite clear that between 625 and 725 rcm (reciprocal centimetres) the absorption is saturated. 47, Alastair MacDonald: Only the surface layer which does not convect has its temperature raised by increased CO2. Let me try again. What are the mechanisms by which accumulating CO2 in the atmosphere melts surface snow and ice without warming the atmosphere within which it is accumulating? The process doesn’t work quite like this. Currently CO2 is absorbing all energy so is saturated in that sense, but only that sense. And the molecule then radiates that energy to other molecules and to space etc. But remember the atmosphere is not homogeneous, it gets colder as you get higher. We add more CO2, we shift the envelope of radiation to space higher, so increase the quantity of warming “in the system”. The only limit to this process is the quantity of fossil fuels we have to burn. Given IPCC predict 6 degrees worst case by 2100, I would guess 12 degrees is upper limit. And this is a real scorcher. BPL has written a very comprehensive article on it. I don’t know the physics equations, but can follow the logic. Obviously you also have to consider temperatures on Venus which strongly suggest adding more and more CO2 pushes up temperatures until whole atmosphere is CO2. 56 Mack … it’s the atmosphere which raises the temp of this planet. The Moons temperature? Same Sun as the earth’s Sun …. who knew? Not our Big Mack, that’s for sure!!! The Diviner instrument on NASA’s Lunar Reconnaissance Orbiter measured temperatures of minus 396 F (minus 238 C) in craters at the southern pole and minus 413 F (minus 247 C) in a crater at the northern pole. “These super-cold brightness temperatures are, to our knowledge, among the lowest that have been measured anywhere in the solar system, including the surface of Pluto,” David Paige, Diviner’s principal investigator and a UCLA professor of planetary science, said in a 2009 statement. Did you hear about the newly opened Al la carte Restaurant on the Moon? “December air temperatures at the 925 hPa level (about 2,500 feet above sea level) throughout the Arctic Ocean were 2 to 6 degrees Celsius (4 to 11 degrees Fahrenheit) above average. Prominent warm spots were found over north Central Asia and Central Alaska (more than 10 degrees Celsius, or 18 degrees Fahrenheit above average), as well as over Svalbard and Central Siberia (nearly 6 degrees Celsius or 11 degrees Fahrenheit above average). I always thought it strange/odd that graph makers would use the same band of colour as the adjacent / recent years results. This time it’s red. Before that Purple, Yellow, Green and Blue alongside each other. This despite the fact that ‘we’ already know that Complementary colors are opposite to each other on the color wheel, so they create a strong contrast. IPCC/NSIDC trends [based on SIE sea ice extent] underestimate the real speed of ASI loss – true/false/maybe. October 2017 ASI volume was 65% below the maximum October ice volume in 1979 – true/false/maybe doesn’t matter. Sea ice volume is an important climate indicator. It depends on both ice thickness and extent and therefore more directly tied to climate forcing than extent alone. However, Arctic sea ice volume cannot currently be observed continuously. Observations from satellites, Navy submarines, moorings, and field measurements are all limited in space and time. Arctic sea ice extent (ASIE) for December 2017 averaged 11.75 million square kilometers the second lowest in the 1979 to 2017 satellite record. This was 1.09 million sq.kms below the 1981 to 2010 average and only 280,000 sq.kms above the December 2016 record low extent! Pre-1900s (say 1850 to 1880 avg.) in December it was usually closer to ___ ? 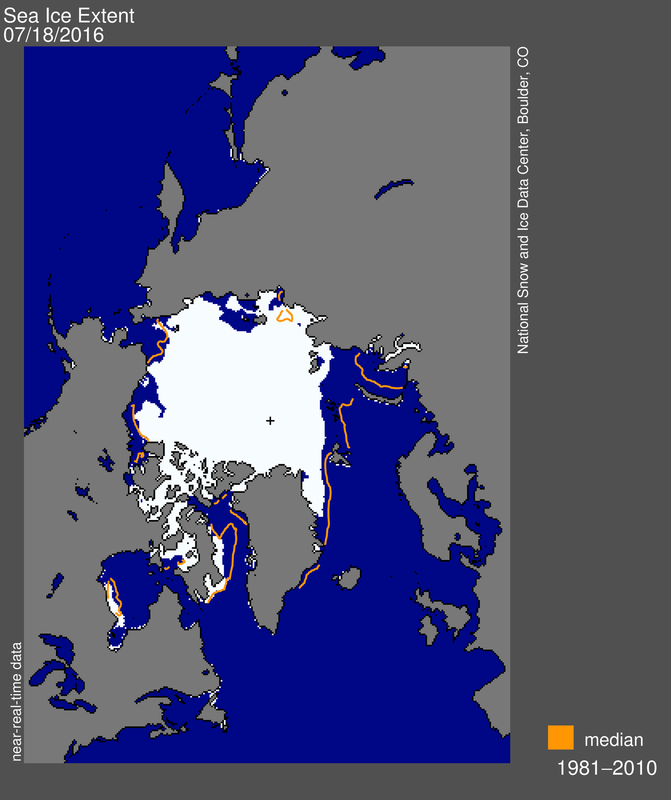 million sq.kms of Arctic Sea Ice Extent? #7 Jan Galkowski said While Anderson and Peters (and Hansen) are technically correct about the negative emissions necessity, no one is speaking as if they’ve done the cost analysis of drawing down 200-300 ppm CO2 using direct capture or other means. Anderson makes this point, that the full range of economics are not considered. But, then, economics is voodoo, or as Anderson puts it, astrology, so it’s of limited use, anyway. More to the point, as Anderson also correctly says, you can’t get there via current economic models, so whatever numbers they may churn up are irrelevant. All the more reason to stop thinking in these terms at all: It’s all fairy dust. If we are to succeed, measures like $ and GDP simply will not be relevant. 1. Reductions in the temperature differential between tropics and polar regions reduces the momentum of the general circulation. 2. Lessened general circulation weakens the jet stream because less air is moving downward at the intersection of the Hadley cells. 3. A weaker jet stream is by some unknown mechanism is induced to wriggle more; that is, its north-south range increases. Perhaps this is the result of the Hadley cell lengthening or shortening. 4. A southward loop in the jet stream creates a low-pressure area in the interior of the loop, which draws polar air southward. Bereiter et al. have a nice paper with very pretty data for mean ocean temperature (MOT) based on noble gas isotope ratios in the WAIS divide core. Would the experts here chime in ? I thought the winds do things too. Are there any image based representations of that data in different time periods as yet? any tips for url refs/websites? My rough guesstimate seeing that example from 1882 could indicate that the Minimum SIE in the 1880s has shrunk by about Half (?) today. imho it would be good to see a decadal scale “Charctic Interactive Sea Ice Graph” from 1850 to 2010. Would that help more “pennies to drop”? Because the satelite imagery from 1979 on doesn;t really tell tell the whole story up there. I wouldn’t say that you are safe in completely rejecting the influence of sea ice cover; looking at the thermodynamics of SIE over a yearly cycle is a field of study in itself. Winter, summer, radiation both ways, humidity, wind…feedbacks…? Way above my pay grade. With respect to your #3, I would ask what you mean by “the” Hadley cell. note 1: I personally would argue, from first principles, that movement of air masses N-S has to be part of achieving whatever the new equilibrium state will be. Maybe Omega can conjecture a different way that the increased energy in the system could be redistributed, but I sure can’t. Killian at 57: How to find the words that will lead the horses to water *and* make them drink…? I think the 2016 week was a little spikey. In any event, 407.4 is not where we want to be. I will repeat what you seem not to grasp. Saturation per se does not matter. The energy absorbed must go somewhere and it is transferred to the rest of the atmosphere through conduction and radiation. Some of that heat is radiated downward and some is radiated upward. The heat is is reabsorbed and reradiated until reaching the height of the atmosphere where it is thin enough to pass unimpeded to space. Adding more CO2 raises the height in the atmosphere where that can occur. I can explain this to you, but I cannot understand to for you. You must make the effort to understand how the physics actually works., Saturation his not a limiting factor in any way. AM 58: However, I cannot resist the temptation to point out that it is no wonder that your model of the Venus atmosphere does not work when you think that “saturation doesn’t f****g matter”. BPL: You are only familiar with my Venus models of ten years ago. My recent Venus models routinely achieve 700 K at the surface. AM 61: It is quite clear that between 625 and 725 rcm (reciprocal centimetres) the absorption is saturated. BPL: And it is equally clear that it is not saturated higher up, and since all levels matter, saturation is f*****g irrelevant. More CO2 will still lead to higher surface temperatures, even when the 15-micron line is saturated. You are also ignoring all the other absorption lines of CO2, and for your information, it has tens of thousands of known absorption lines. BPL: No matter how many times you say this, it still won’t be true. You are right the jet streams are basically related to the hadley cells, and climate change is altering the hadley cells. More warm air in the arctic is causing the jet stream to weaken and wobble around into loops going further south. However the loops in the jet stream do not as you suggest form depressions drawing in colder air. Think of the jet stream loops as being like a boundary. Colder air moves south as the boundary moves. I have already explained that the surface layer of the atmosphere does warm, but the current idea of a lapse rate feedback where increased CO2 causes the whole atmosphere to warms is incorrect. I see that since your post there have been several other posts; 75, 76, 77 all denying that saturation is important. But that just supports my original point made in #15, that the scientists are not lying when they say we can restrict warming to 2C; they believe black is white! Alistair @48: you seem to be confused. Take any moment in time and define top-of-atmosphere as those molecules where a photon has just been emitted and is about to make a final escape to space with no further encounters. Now keep that scenario, but modify it to increase the density of CO2. And while we’re at it, it’s also easy to see that the added CO2 will have a kind of half-life in its ability to do the steps above: once you’ve added N CO2 molecules, another N would have fewer opportunities to trap the outgoing photons of the original scenario, because some of those were already intercepted by the first N molecules. So the net heat-trapping effect of added CO2 is logarithmic with respect to the number of added CO2 molecules. That’s it — the basic greenhouse gas argument. Everything else is just added detail. Saturation never appears in it, and would appear only as a complication in the exact timing and pathways of the additional trapped energy as it ultimately degrades to heat energy. As I said, I’m just a layman here, so someone please correct me if any of that is in any way wrong. BPL, for a guy who writes books, you write incredibly pointless and vapid comments. Your responses are stupidly simplistic. Uh-uh! should have stopped seeming like a good response by the time you stopped wetting your pants. I haven’t access to the full Buizert et al (2018) ‘Mean global ocean temperatures during the last glacial transition.’ but the [Ref 34] incorporated into your quote from that paper is Buizert et al (2015). This earlier paper does show a role for wind amongst the various factors strenghtening/stabalising the AMOC but the winds in question are Southern Hemisphere westerlies. I was referring to your appeal a few months ago for help with your Venus model, not ten years ago. Do you deny there are still problems with it? If it is all absorbed at lower levels then what happens higher up “is f*****g irrelevant”. No need to reply because this is the last response you are going to get from me. It is clear from what he wrote that Weart is unaware that the full description of Koch’s experiments is in the paper Koch published, which was published here: https://www.biodiversitylibrary.org/page/32299447#page/489/mode/1up , and not in Angstrom’s paper. In order to determine the dependence of the absorption of the layer thickness, direct experiments with heat sources of different temperatures are desirable, and Herr J. Koch is employed in the local physical institute with such experiments. The results of this study, which Herr Koch himself will report on, are only to be highlighted. From the results of this study, on which Herr Koch will report himself, it is to be emphasized that only 10% of the radiation from a black body at 100° is absorbed by a carbon dioxide layer of 30 cm in length at 780 mm pressure, and that if the pressure is reduced to 2/3, the absorption change is negligible — at most 0.4% of the total radiation. Thus, a layer of 30 cm in length has almost completely effected the absorption of the radiation of a heat source of 100°. It is clear from these studies and calculations: first, that at most approximately 16% of the Earth’s radiation is absorbed by atmospheric carbon dioxide, and second that the overall absorption is very little dependent on changes in the atmospheric carbon dioxide content, provided that it is not less than 0.2 of that which now exists. This is almost word for word of the description in Frank Very’s piece. Weart complains that Koch should have used a longer tube than 30 cm, but if he had read Koch’s paper, then he would have seen that Koch used tubes with various lengths, and pressures of CO2. Koch was not a mere lab assistant who conducted a couple of experiments at Prof. Angstrom’s request. He was a PhD student who conducted a series of experiments which showed that CO2 absorption was almost saturated. Modern science has not, and cannot, show that CO2 is not saturated. The question then arises, how is it that carbon dioxide concentration seems to drive the climate? I have an answer, which I have only outlined here. However, it is unlikely that an unknown person like me would get such revolutionary ideas published. I am now working on another simpler problem: where did the CO2 come from during glacial terminations? So forgive me if I don’t reply to you in the future. I will be too busy with this other project. I am curious if there is a ‘science’ repository for (or a series/collection of published papers that addresses ) these kinds of climate change impacts already happening all over the world? Is this Irukandji jelly fish report another anecdotal example of the impacts of increasing temps and climate change? It seems very similar to the southbound expansion of cane toads the last several decades which is well known in aus. The bleaching of the GBR is another, and the sudden mangrove die off in the Gulf both recently. a few decades back Irukandji was only ever found north of Cairns. http://irukandjijellyfish.com about a decade ago it was showing up at the south end of the GBR near Bundaberg Qld. What might the on the ground reality be in various nations when temps avg +1.5-2.0C above the 1880-1920 Base Period? Surely every nation has prevailing climate norms that have already changed enough to impact ‘normal life’, ecosystems and general conditions (in some way that’s very noticeable) ??? I have previously suggested this seems quite ‘logical’ – nice to see a confirmation in print. I’d like to see that animation based on the 1880-1920 period. How could it not be the case? Temps rise, then spike on top: Exceptional death and destruction. Temps settle a bit, but keep rising over all, then another spike, more exceptional death and destruction. It’s the extremes, stupid. – Me to self, @ 2011. We have centuries, though! Or maybe not. Moving territories? Gotta be a reason. Following the temp gradient and/or following the food supply following the temp gradient? Bingo. Horsecrap! Dude, I know Spencer Weart. He is a cautious, experienced and very accomplished historian of physics. The idea that he has an incomplete understanding of Herr Koch’s work is simply absurd. What is more, you leave out a very important fact: Koch was wrong. That has been shown again and again in the past 50 years. Not only that, we know WHY he was wrong. A lot has happened in the study of Earth’s climate in the past century. Catch up! BPL: No, the sense of economics is to study how societies produce and distribute goods and services. Crack a book, okay? K 82: BPL, for a guy who writes books, you write incredibly pointless and vapid comments. Your responses are stupidly simplistic. BPL: Who wants to bet he doesn’t see it? K: Uh-uh! should have stopped seeming like a good response by the time you stopped wetting your pants. BPL: I don’t think this is a sentence. AM 84: If it is all absorbed at lower levels then what happens higher up “is f*****g irrelevant”. BPL: No, it is not. If more is absorbed at higher levels, they will radiate more, and some of that will radiate down, which will be picked up by the lower levels, which will in turn radiate down, raising the surface temperature. Why you continue to deny this escapes me. I think perhaps you’re too invested in looking at the atmosphere as a single slab, like Angstrom and Koch did. It isn’t. AM: No need to reply because this is the last response you are going to get from me. AM 85: it is unlikely that an unknown person like me would get such revolutionary ideas published. BPL: You are not unlike Galileo; brilliant, but persecuted. However, it is unlikely that an unknown person like me would get such revolutionary ideas published. The lack of publishability would be due to a lack of an understanding of physics. Revolutionary ideas need extraordinary evidence and need to conform to the known laws of physics. Your ideas meet neither criteria; hence, would not be published. You continue to ignore the fact that although the lower atmosphere is optically thick with CO2 and although it absorbs most long wave radiation, that heat is distributed in the atmosphere and the atmosphere reradiates in all directions. That heat once again is reabsorbed, redistributed and reradiated both up and down the atmosphere. You also ignore that the absorption and emissivity profile is dependent on the temperature and pressure. You ignore that It is where in the atmosphere that the density is such that the CO2 in the atmosphere becomes optically thin so that reradiating heat can finally escape unencumbered to space. Adding CO2 raises this level. A level where it is colder and therefore less heat radiated thus causing thermal imbalance with the incoming solar radiation. The only way to restore the balance is for that layer to warm via a warmer surface. That the *effect* of CO2 is not *saturated* is confirmed by observations. Measurements of incoming long range radiation from the moon shows a decline in that radiation as the moon is lower in the horizon–the result of the radiation passing through more of the atmosphere and thus subject to more CO2 absorption. Measurements of outgoing long wave radiation at TOA by satellites shows the long wave radiation has diminished over time as expected due to increases in CO2 as has the radiative imbalance been observed. Also measurements of downwelling long wave radiation at the surface have shown increases over time as expected due to increase in CO2 levels. No, despite your claims, scientists do not ignore *saturation*. Although you are deluded to think otherwise, you are not gifted with a superior knowledge of the physics over the brilliant scientists who have wrestled with this problem for many decades. Wrong. What happens at higher elevations is everything. Your refusal to make an effort to understand the science is tiresome. What makes you think that the core denialists (Tea baggers – Trumps core base), have the ability to understand those or any other graph? In my considerable experience, they don’t have the intellectual capacity to do so. Of course we all know climate change increases probability of heatwaves etc, but this comment is particularly interesting: “While it is record-breaking that tends to make news, scientists say it is the unbroken run of hot days in the high 30s and 40s that causes the significant problems for human health, and other life.”It’s not being able to cool down at night, and in the days that follow, that causes problems,” he says.